Here's a perfect deck of cards for those times when you'd like to use a smaller size, yet in perfect proportion! 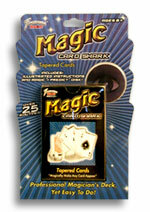 These are great for card magic predictions and other effects as well. Mini Bicycle Cards are available in red and blue colors. These miniature cards measure 1.75" wide by 2.5" tall.